Delivered Within Bangalore City Limits! 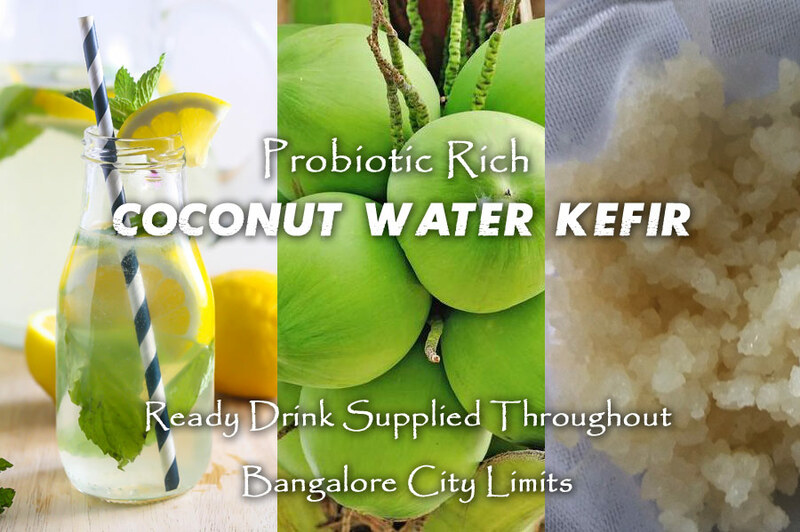 We ferment Coconut water kefir using 100% pure tender coconut water which is rich in natural electrolytes, enzymes, minerals, nutrients and natural sugar. The kefir grains feed on natural sugar from the coconut water and converts the nutrients to beneficial probiotics leaving a fizzy, sour, and elixir tasting drink. If anybody is avoiding milk or intolerant to dairy (lactose or casein) can have this wonderful and healing drink to build healthy flora within the guts and improve digestion. It is tastes slightly sour and fizzy. We infuse lemon and organic mint leaves to give a punch. How long can I store this drink? You can store upto 15 days in the fridge, please burp (open) every 2 days once to release the fizz developed. Or you can keep the lid slightly loose. Can Children have this drink? Yes, it adds healthy bacterias to the gut and build immunity. You can see one parent testimonial how they have treated their autistic child to overcome autism using coconut water kefir! Start with less quantity (few tablespoon) and increase gradually upto 1 cup per day. Best to have at bed time or evenings. Serve chilled. For children, check for desirable chillness before serving. Just send a whatsapp message at +91-8277718123, we deliver within Bangalore city limits on particular days for each location. We prepare coconut water kefir on order basis only. Rs.450 Per Liter in Glass Bottle. Minimum 2 Liters for home delivery. You can also combine milk kefir or kombucha tea (Rs.400) if you need just one liter of coconut water kefir.